Atlus’s Persona franchise has reached a number of variations since the first Persona debuted. Now, Atlus is bringing a lot of the characters from every franchise and pitting them against each other. During my couple of fights (where I got utterly destroyed), Persona 4 Arena Ultimax felt similar to other traditional fighters like Street Fighter 4 and Guilty Gear, rather than the insane speed of Super Smash Bros. and Marvel vs. Capcom. The fighter proposed a different button layout as well. Four buttons are given to the player to the usual six button layouts of other fighter franchises. This doesn’t change the dynamics of fighting too much, but gives players another strategy on beating their opponents senselessly. Using a similar look as Guilty Gear, where beautiful 2D hand-drawn animations fill the screen. I only got hands on time with two characters, but the fighting felt smooth and consistent. Not slow enough to make things boring, but not fast enough for you to have the reflexes of the Flash. It’s nice to see another fighting game other than another Street Fighter or Mortal Kombat coming out. Beautiful and traditional gameplay and graphics are back for another run for the new generation of systems and I can’t wait to see more. 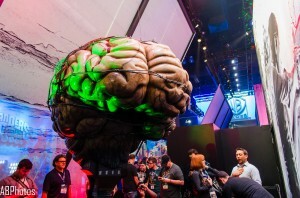 Capcom can release some very serious games and others just seem so mental, you are left scratching your head wondering how they decided to release something so…unique. The new DLC for Dead Rising 3 not only has the most ludicrous and hilarious title for a game, but the entire game itself is a tribute to past Capcom characters. Dead Rising 3 may had hordes of zombies to kill and maim, but also has a story and other objectives to enjoy. 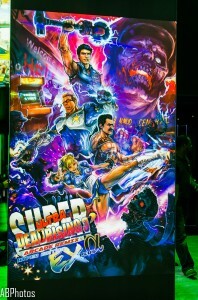 Super Ultra Dead Rising 3 Arcade Remix Hyper Edition EX Plus Alpha (and…breathe) takes away the story and just throws hordes of zombies at you to beat them to a pulp. Forget figuring out what’s going on, Capcom just wants you to have fun in their newest DLC. The new Dead Rising 3 DLC is full of dumb fun. Just get in a game (solo or up to four player co-op) and just start doing Hadoukens or Body Slamming zombies. Play as Ryu or some other random Dead Rising character dressed up in Capcom cosplay and revel in the nostalgia and mayhem. Monster Hunter is showing up on the Nintendo 3DS once again and the game looks and plays amazing for a handheld game. 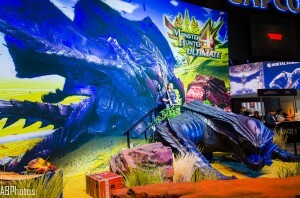 Before I get into the demo, I have a confession to make – I never played a Monster Hunter game before. I’ve always wanted to get my hands on it, but there were way too many games to get into and this franchise became more of an afterthought as time passed. Now, after getting some hands-on time with the newest iteration. I’m ashamed to say, I have missed out on a great franchise. Monster Hunter’s graphics were fantastic and smooth; giving great depth and a level of detail not seen since Super Mario Land. No hiccups or other graphical issues occurred playing through the demo. Gameplay offered a simple, yet complex battle system which had a few elements, in which strategies change depending on which monster you are aiming for. I guess it’s time to dust off the 3DS and enjoy a game I’ve been missing out on. The team behind Fallout: New Vegas and Star Wars: Old Republic II move from RPGs to a free-to-play game involving tanks. Now, World of Tanks is…pretty much the only game where tank battles are lighting up online gameplay, but the team behind Armored Warfare are looking to shake things up a bit. Obsidian Entertainment provided an early E3 alpha demo of Armored Warfare’s co-op mode. The primary objective requires my team to capture a fuel depot and take out any enemy tanks guarding it. A secondary objective and other specific-class objectives are also handed out for players to gain more experience and level quicker (which of course lets players gain access to other tanks and content) by completing any or all of the side objectives. There were three classes my team were able to choose from: Artillery, Scout/Spotter, and Frontline/Main tanks. I chose to be a fast and agile scout/spotter tank. My tank can fly across the battlefield and highlight other tanks on the map for my teammates to take out. Speed is key for this class, since there is virtually no armor provided to this specific tank and one or two shots will take out my tank easily. The developers suggested for me to stay between the artillery and the main line maintain a safe distance spotting tanks. Plus, my tank’s damage capabilities were equivalent to a bee sting and pretty much useless in outright firepower. Artillery is delivers devastating damage to enemy tanks and are advised to in the back ranks. Like the scout/spotter tank class, armor on the artillery tanks practically doesn’t exist and mobility is also a big issue. Once an artillery tank gets caught out of place and its game over. Main tanks can take the most punishment and deal a decent amount of damage, but are mostly there to keep other tanks from pushing through the front line. Armored Warfare ran well in its alpha stage. Yes, there were some issues for our artillery man, but besides that the game was really polished. The destructible environments adds more realism and the graphics run on CryEngine 3, which equates to amazing graphics and only looking to get better as Obsidian works on the game more. I wouldn’t be surprised on how much greater the game will look and play in beta and once the game finally releases. Bringing real-world cars into the Forza playground and expanding it by setting the cars free in a open world setting, Forza Horizon 2 looks to best its predecessor in every way…or so I thought. 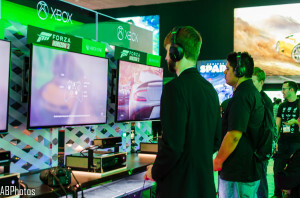 Forza Horizon 2’s E3 demo showed a very small segment of what the game will have to offer, but I was expecting something new or a little different from the show. 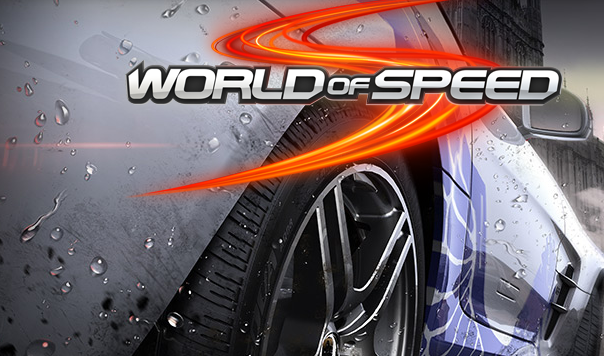 In the demo, three cars were available to race with: Lamborghini Huracan, Chevrolet Corvette, and the Nissan GT-R. I opted for the beautiful looking Lambo and had a race through the new map. The first Forza Horizon featured Colorado as its playgroud, in the second one the playground moved over to the southern side of Europe (exact destination unknown). Graphical improvements were noticeable, but not as sharp or detailed as I thought it would be. Compared to The Crew and especially Driveclub, the graphics were nowhere near these two. Again, the game is still quite some time away from being released and the developers have plenty of time to tweak the graphics. The map surprisingly didn’t have a real difference from the last. I felt as if I was driving in Colorado. Maybe the developers didn’t want us to see what they had in store, but again I expected the game to show something different. Impressions are average, but the team at Playground Games have plenty of time to make Forza Horizon interesting and fun as they did with the first game. As of now, I see more Forza Horizon 1.5 than 2. The team behind Need for Speed: Shift 1 and 2 are tackling the MMO landscape with a racing genre. The idea sounds crazy, but then again they are called Slightly Mad Studios. Similar to The Crew, the game is built more around teamwork than individual players. In the demo, we only drove a lap using a stock Mitsubishi Lancer Evo X and an upgraded version of the car. The guys behind the game wanted to show the difference of what players would be able to get and preview on how different each car would feel. Modding isn’t going to be as heavy as Gran Turismo or Forza is. You can’t tweak the suspension or other finer details of the car, but the developers are always open to feedback – so, it doesn’t mean the game won’t provide the option in the future. Mods are also randomize as you gain levels and beat achievements. Racing games offer gamers the best parts right away, albeit they have to race and gain enough money/credits to earn those parts. World of Speed looks to even the playing field more. Instead of allowing the best mods to be gained, they will have randomized mods to keep players playing for the best parts. There is no “best” mod for a car and can randomly change a stat. A nice way to keep players playing the game and earning what could be the best part. The game is in early developments still and Slightly Mad Studios still say they have a lot of work to do. I see some promise for this MMO Racing game. But until, they show more the MMO racer is going to need some heavy firepower to fight for the Gran Turismo and Forza crowd. After the insanity of Vaas, the new one looks just as crazy – or even crazier – than the last one. 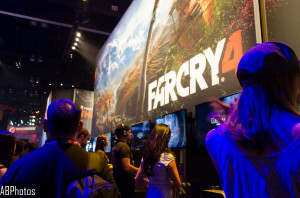 Set in Kyrat, the game has a couple new exciting elements added to the gameplay. First, is the wingsuit. Sadly the E3 hands-on demo didn’t allow us to use it, but in the trailers, being able to BASE jump and fly around the map seems way more fun than hang-gliding. The second new element is the elephant. The elephant acted more as an ally during the demo, but maybe it can also be an enemy if you decide to piss off a large animal like that. The elephant was one of the best parts of the demo. Use it to bash down the gate or ride it while you shoot your way into the fortress. The elephant will also maul down any baddies and bash enemy cars out of the way. The third new element shown at the demo and trailer was the gyro-copter and the possibility of playing co-op. The graphics brought the Far Cry world to life with beautiful landscapes and smooth fps rate. Even with the taste of taking down a fortress, the game shows a lot of promise and a continuation of Ubisoft’s string of hits. But seriously, this game is scary. Make fun of me all you want, but The Evil Within will deliver an atmosphere to make you scream. I didn’t get far in the level, because I kept dying over and over again. Which in turn didn’t allow me to fully experience the horrors of the game, but then again I was more relieved to end this terror and get the hell out of there. For those looking for something promising within the horror genre, The Evil Within looks to deliver everything you wish for. 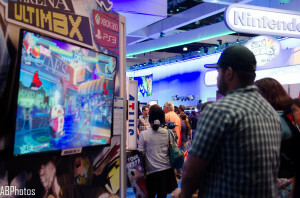 E3 coverage is almost done with Part 3 coming your way.